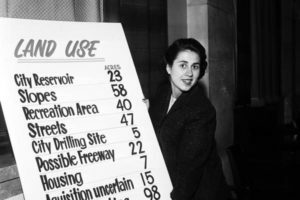 Beyond her twelve years in elected office, Wiener Wyman’s political legacy perhaps best lies in her fundraising efforts for other Democratic candidates. During one memorable event in the backyard of her Los Angeles home, Wiener Wyman and her husband, Eugene Wyman, hosted a dinner for Democratic congressional candidates and charged $5,000 a couple, an unthinkable sum in 1972. Rosalind Wiener Wyman’s life and career point to the many ways in which California women have and continue to engage in political life, as well as the rich collection of political history at the Oral History Center. As we approach the hundredth anniversary of women’s suffrage, documenting the experiences of these women political leaders will become all the more important.